In 2016, Aarsleff Ground Engineering were awarded the piling contract for the mega distribution hub, as part of homeware giant The Range’s new distribution centre in Bristol. The new distribution hub for the well-known national retailer will be the biggest single building in the South West and one of the largest in the UK. It is thought to be the equivalent size of 5 Wembley Stadiums. Aarsleff were subcontracted by the contractor Stoford Development and the client of the project, McLarens Construction, in a contract worth £5.4 million. This is the largest piling project that Aarsleff has ever undertaken in its 25-year history and is a tremendous vote of confidence in their precast piling solutions. Aarsleff installed over 15,000 precast concrete piles to support both the main slab and roof stanchions of the completed structure, as well as a number of peripheral buildings, such as sprinkler tank bases and dock leveller pits. The majority of piles for the project were 250mm square section driven precast concrete piles (DPC), with the remainder being 300mm square piles. Aarsleff demonstrated business excellence by reducing the programme time and keeping costs low in order to deliver the mega distribution hub. Aarsleff were initially contracted to install 13,250no of precast concrete piles for the project, which started in July 2016. Just 10 weeks before completion, a further 1,750no of precast concrete piles were added to the original design scope. Aarsleff adapted quickly and effectively to the change in the project design, and were able to react professionally to the client’s project demands. The tight delivery requirement meant that several piling rigs would need to be utilised. 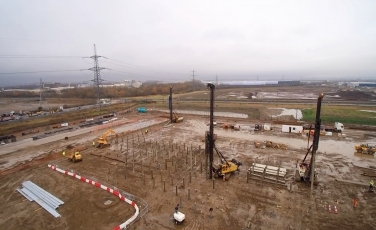 This required precise planning and delivery of each section, with over 15,000 piles to an average depth of 17.5m, the installation and delivery of the physical product gave the planning team and the manufacturing arm of the business a clear logistical requirement for delivery of over a quarter of a million linear metres of piles. Despite the addition of work to their scope, Aarsleff completed the project 2 months before its target completion date. Aarsleff delivered the enhanced scheme on time by working weekend shifts with the on-site rig installation, and also by increasing the factory production times for weekend and shift works. The scheme in Bristol was a highly sensitive scheme because the original proposal for a 72,000sq m regional centre at Allington received extreme opposition from local residents in Chippenham, despite the fact that the scheme would raise 1,050 local jobs. The local community raised a petition against the construction due to the high levels of traffic and disruption likely to be caused by the development, with more than 1,700 petitioning against the plan. The scheme location was moved near to Bristol; however, the local opinion was not receptive. With this in mind Aarsleff’s client engaged the contractors for the scheme looking to mitigate the impact of the construction process on the local community. Aarsleff advised that we could speed up production with a greater number of piling rigs, deliver its products to site out of rush hour times and also incorporate noise limiting techniques to minimise the impact of the works. Aarsleff completed this scheme with zero resident complaints, which is a testament to the planning and implementation from our contracting staff. The scheme was exciting for Aarsleff, due to the way they contributed to the overall success of the project. Aarsleff were honest about the potential risks and cost implications of the job, and were able to advise its client of best practise. Aarsleff assisted the client to win the project by working with them to assess the likely cost implications of various loading scenarios for the then unconfirmed roof loadings. The scheme at its tender stage for example, was compression piles only and Aarsleff highlighted to the client the fact that the column piles are most likely to attract horizontal and tension loads. Given the scope of works, it highlights the high degree of trust the client put in Aarsleff, the result of its previous experience in the commercial and industrial industry and its industry reputation. The overall project cost was £90 million and the project was finished in December 2016.